In the framework of the HYPEREGIO projects BusyBee and Innovation2Market, the project consortium organizes a partnermatching event on the topics of eHealth and Wearables. During this event, the goal will be to showcase the research done by the universities in the Euregion Meuse-Rhin. 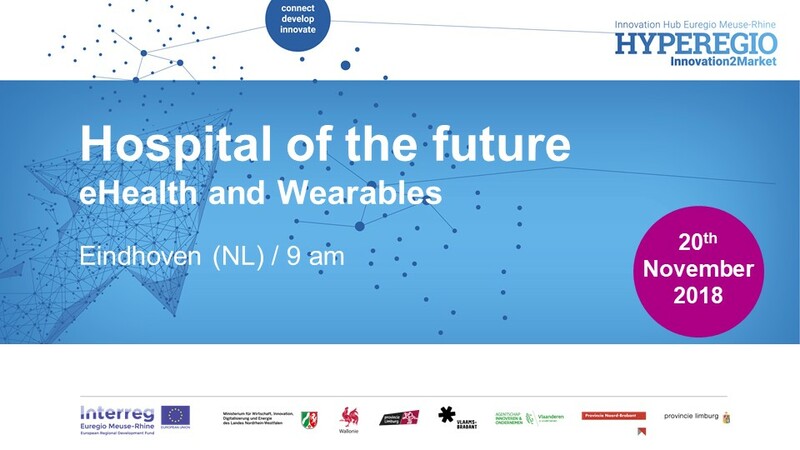 Next to that the event aims to lift the crossborder cooperation in the euregion Meuse-Rhin on the topic of “Hospital of the future” to a higher level. There where the focus will be on the link between hospitals and research before noon, the event will focus on industrial coorperation in the afternoon. For this afternoon session, there is still some room for pitches of interesting companies. This event brings together 3 stakeholders in the innovation roadmap of healthcare institutions: the hospitals or caretakers, the research communities in the universities and knowledge institutes and finally the industrial partners, active in the Smart Health domain. Participation in the event is free of charge, but registration is mandatory. Please use this registration form (DSP Valley). This time, the Jülich-based company MeteoViva gives us an insight behind the scenes. Behind MeteoViva is the vision of Managing Director Markus Werner: that the indoor climate of every building can be controlled in advance using a model. In his analysis of energy-efficient building concepts, he discovered that heating, cooling and ventilation can be optimised in any building if a dynamically calculating calculation model is used that takes into account not only the weather, but also the use and physical behaviour of the building, including its system technology – the starting signal for the development of a key technology. With MeteoViva Climate, the company offers a smart data solution patented throughout Europe that makes building technology smarter and more efficient without much effort – manufacturer-independent, cross-technology, forward-looking and intuitive to operate. MeteoViva Climate is used throughout Europe in over 70 large buildings with approx. 1.2 million sqm and almost 10 million € energy costs. Take the opportunity to get a glimpse behind the scenes and meet entrepreneurs and scientists from the Euregio Meuse-Rhine. Die Veranstaltungsreihe “Early Birds Technology Breakfast” richtet sich an aufgeweckte Unternehmer, die sich zu früher Stunde und frühzeitig mit Zukunftsfragen, die für die Entwicklung ihrer Firma von Relevanz sein können, auseinandersetzen. Bei unserem Technologiefrühstück möchten wir Sie zum Nachdenken und Querdenken inspirieren und Sie in lockerer Atmosphäre in ein gastgebendes regionales Unternehmen zum Netzwerken einladen. Unsere Absicht ist, den innovativen oder innovationsinteressierten Unternehmen eine nachhaltige Plattform zum Austausch untereinander und zur unkomplizierten Kontaktaufnahme zu den euregionalen Hochschul- und Forschungseinrichtungen zu schaffen. Merken Sie sich schon heute den nächsten Termin am 21. Mai um 8.15 Uhr in Herzogenrath vor. Für Rückfragen steht Ihnen Iris Gerdom, StädteRegion Aachen, unter der Rufnummer 0241 – 5198 2132 oder per E-Mail iris.gerdom@staedteregion-aachen.de zur Verfügung. Da die Teilnehmerzahl begrenzt ist, melden Sie sich bitte bis zum 14. Mai über das Seminarportal der StädteRegion Aachen oder per E-Mail an iris.gerdom@staedteregion-aachen.de an.